Boston, Lawrence mayors slam Trump’s comments in N.H. In a speech announcing a new national plan against the opioid epidemic, President Trump Monday called for a crackdown on sanctuary cities — cities that restrict their cooperation with federal immigration authorities. Tying his strict immigration rhetoric to the overdose crisis, Trump mentioned two Massachusetts cities by name — Boston and Lawrence. “It’s time to stop painting all undocumented immigrants as criminals. Our immigrant community makes positive contributions to our city each and every day,” he said. “This epidemic is not something we can arrest our way out of — we need actual investments in prevention and treatment programs and policies, not just talk. President Trump on Monday unveiled a new plan to combat the opioid epidemic — including tougher punishments for those selling drugs illegally. “Shame on the president” he said at a news conference. Lawrence is one of two cities in the state that have sued the federal government over an executive order signed by Trump last year that would strip sanctuary cities of federal funding. Both Chelsea and Lawrence have challenged the order, calling the proposal an unconstitutional penalty for local governments that have sought to build trust with their immigrant communities. In November 2017, a federal judge in San Francisco permanently blocked Trump’s executive order, ruling that Trump cannot set new conditions on spending approved by Congress. 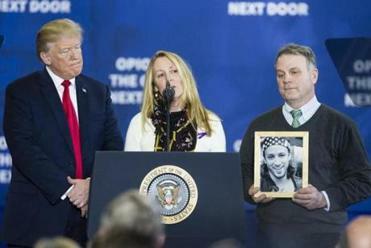 In his speech Monday, Trump cited a recent Dartmouth College study that found that Lawrence “is one of the primary sources of fentanyl in six New Hampshire counties.” He omitted that Lowell was also mentioned in the report as a primary source. Lawrence is slightly more than 70 percent Hispanic or Latino, according to records from the 2010 census, while Lowell stands at just over 15 percent.